A harrowing sci-fi thriller about a teen who's survived horrors but lost her memory, for fans of Veronica Roth, Stephen King, and Justin Cronin. The Arclight is the last refuge in a postapocalyptic world consumed by terrifying monsters called the Fade. No one crosses the wall of light that keeps the last human survivors safe. There's nothing else left and nowhere to go. Or so they thought, until Marina, a lone teenage girl, stumbles out of the Dark. I stumbled upon arclight in the audible browse page. Amazon reviews only set it at 3.5 stars and that blew me away! This is a story about a world lost to darkness. A human colony huddled frightened in the one spot of light left. It is also a story about empathy. Putting yourself in your enemy's shoes and trying to understand those who are different rather than fear them. For those of you who like to contemplate what it means to be human, what it means to be "good" or "evil" and what you are willing to sacrifice for safety...give this one a go. I had a little bit of a hard time wrapping my head around the whole concept. 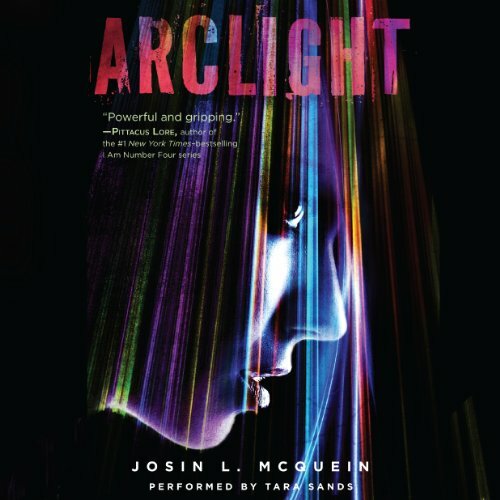 The moment I saw the cover of Arclight I was really intrigued and could hardly wait to read this one! And I actually ended up really liking it! I had the ARC but I ended up listening to the audio on Audible. It was so interesting! Very creative story and I'm sure everyone will be interested in The Fade. I really loved this book. It was a bit odd at first, but when Marina started to get memories back, all made sense. And was sad. And scary. And shocking. I can't wait for book 2! started preatty redundant as any distopia than picked up, had its own unique twist and flavor, more than "oh no, bad government, got to overthrow it and rise up"
This story could use a fine tooth comb. There are a lot of gaps, a lot of things that don't make sense and never get explained. It's hard to suspend reality when you don't know wtf is going on half the time. The Fade make no sense. If there was a decent description of them and their abilities I totally missed it and am very confused about what they look like. The first 60% of the book moves so slow I almost stopped listening because I could barely stand it. The last part of the book things actually happen, but at that point I was just finishing the book to say I'd finished it. I will not be reading the second book. I did not enjoy being confused for so much of this book.